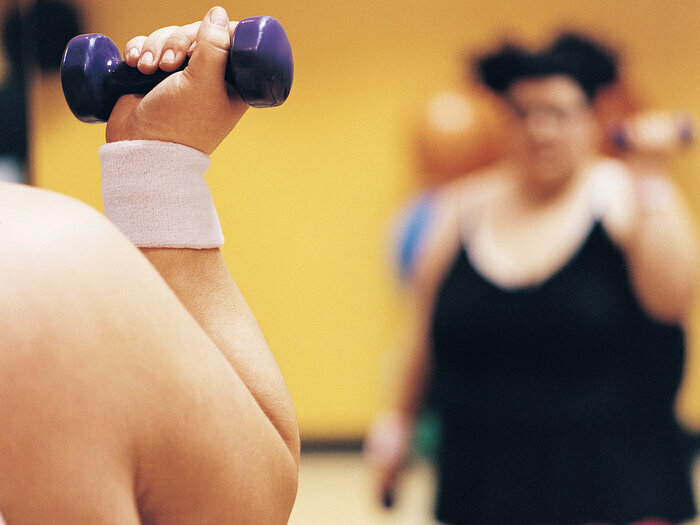 Physical exercise, diet and supportive counseling are the first steps of any weight-loss program. But sometimes that&apos;s not enough to take large amounts of weight off, and keep it off, doctors say. Surgery to reduce the stomach&apos;s size is often seen as a last resort for severely obese teenagers, partly because there has been little information on the procedure&apos;s long-term effects on young people. But a study published online Friday in the New England Journal of Medicine tracked teens for three years and suggests that bariatric surgery as part of a weight-reduction plan was not only safe, but increased their heart health and the quality of their lives. Dr. Thomas Inge, a surgeon at Cincinnati Children&apos;s Hospital Medical Center, led the study of 242 severely obese adolescents who underwent the surgery. The young people were between 13 and 19 years old and averaged 325 pounds at the start of the study, Inge says. Surgery helped them lose nearly a third of their original body weight and maintain that loss for three years. Even more importantly, Inge says, the development of obesity-linked disease was stopped in its tracks. Of teens who had Type 2 diabetes when they underwent the surgery, "95 percent of them had no sign of diabetes at three years," Inge says. Most participants in the study also dramatically reduced their blood pressure after surgery, and had improved kidney function and less blood fat. The hope is that these sorts of improvements in physical markers will ultimately translate to fewer strokes, heart attacks and other disabilities down the road, he says. Previous research has suggested that only about 2 percent of severely obese teens are able to lose weight and keep it off without surgery. Adults who have weight-loss surgery also see reductions in diabetes, blood pressure and blood fat, Inge says. But the improvements aren&apos;t as dramatic — perhaps, he says, because it&apos;s easier to tame a disease that hasn&apos;t already had years to do damage. The teens also experienced a big jump in their confidence. "I think it&apos;s one thing to talk about what this does to their blood pressure and diabetes," Inge says. "It&apos;s a whole other thing, when you&apos;re in the patients&apos; shoes, to be able to talk about how they feel after the operation." The answer, he says, was unmistakably good — so good that some kids made a few other bold changes in their appearance, taking deliberate steps to stand out instead of trying to hide. "It&apos;s very much the routine to see them expressing themselves and saying, &apos;Here&apos;s me with green hair color, pink hair color," Inge says. "It&apos;s telling the world, &apos;This is the new me, and I like it!&apos; And, &apos;Here we are!&apos; "
The surgery isn&apos;t without side effects and these, too, showed up in the study. In addition to the risks of any surgery, bariatric surgery alters how the body digests food — so most of the teens also had to start taking vitamin and iron supplements after the procedure. And about 13 percent wound up needing additional abdominal surgery — most commonly gall bladder removal. These teenagers and others need continued follow-up to be certain that benefits outweigh risks as the years go on, Inge says. But at least now, teens — and their parents and doctors — are starting to get a little more solid information to help guide choices about treatment.